Nutrition is important across the lifespan. Even for a mutt, getting the right nutrients in sufficient amounts can help support the different growth, development, and maturation needs of dogs in various stages of their existence. Like the elderly among us, senior pooches will typically require specialized diets both to meet their age-appropriate nutrient requirements and to improve their declining functionality as a result of advancing age. Owners of elderly dogs should thus, invest in high quality, age-appropriate nutrition for their pets. You can start with our own selection of the 10 best senior dog foods you can ever find in the market today. 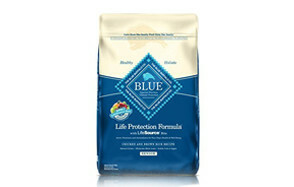 The BLUE Life Protection Formula dry dog food for senior dogs is specially formulated to provide your senior dog with the best possible nutrient profile to support its vital functioning as it grows older. It comes with a mixture of chicken and brown rice for the right combination of tissue-maintaining protein and energy-giving healthy carbohydrates sans the angst related to wheat, corn, or soy. BLUE boasts of its proprietary LifeSource Bits formulation which packs 7 health-giving minerals and vitamins in their age-appropriate amounts into easily digestible dry kibbles. It’s also packed with the right amounts of omega-3 fatty acids for healthier coat and skin while also aiding in the enhancement of canine immune functioning. It may not be the best senior dog food based on the number of customer reviews, but it sure can provide an exceptional balance of the right nutrients to support the optimum functioning of an aging dog. Featuring 12 super foods, Nutro’s ULTRA senior dog foods formulation provides a healthier and more nutritious way of supporting your elderly pooch’s aging body. Its protein content is sourced from a blend of chicken, salmon, and lamb and mixed with 12 of the world’s super foods that include sunflower oil, tomatoes, flaxseed, coconut, egg, pumpkin, spinach, kale, blueberries, apples, carrots, and chia seeds. The chicken meal provides an exceptional source of chondroitin and glucosamine for optimum joint health as arthritis and other disorders of the joints are major health issues among elderly canids. It also doesn’t contain wheat gluten, soy, or corn so you’ll feel safer if one of your concerns is that your pooch might be allergic to these grains. The fish oil content helps provide for the necessary EPA which can aid in the reduction of inflammatory processes while also augmenting the ability of the immune system to ward off infections that are common in the elderly. Nutro’s ULTRA dog food for older dogs is quite expensive though. 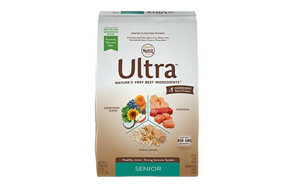 But if you’re looking for the best in senior canine nutrition, you won’t go wrong with the ULTRA. Boasting of a unique probiotic formulation, the Diamond Naturals dog food for older dogs beyond 8 years of age provide exceptional gut-friendliness so that all of its packed nutrients are absorbed relatively well by your pooch. The Diamond is filled with vitamins and minerals from a variety of super foods, helping ensure optimum health for the aging mutt. It also contains substances that strengthens the joints to allow for greater movement so mutts can continue to enjoy being active. The formulation includes chicken with quinoa and chia seeds added into the mix to provide your mutt with essential amino acids. It also contains omega fatty acids as well as healthy fruits and vegetables for optimum nutrition. Its antioxidant profile is also remarkable as it is filled with some of the most powerful substances to fight oxidative stress that is usually heightened with aging. If your senior pet happens to be not drinking too much water or is currently sick that its appetite is somewhat affected, you might want to give it this Homestyle Recipe wet dog food for senior dogs. 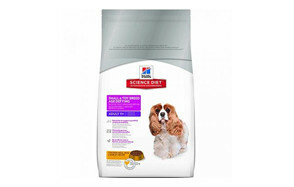 It contains about 78% moisture to keep your pooch well-hydrated even if it is no longer drinking from its bowl. The BLUE Hometsyle is available in single-ingredient proteins such as beef, chicken, lamb, fish, and turkey. Each of these preparations are formulated with the right amounts of nutrients especially chondroitin and glucosamine for healthier joints, helping prevent arthritis or promoting optimum mobility. The Homestyle contains hearty and healthy whole grains as well as antioxidant-rich fruits for optimum nutrition. Since it is canned canine food, expect it to be pricier. As such, you might want to reserve this for really sick pets or perhaps mix it with their favorite kibble if in case its price is a major consideration. If not, then feeding it with Homestyle senior dog foods should be an excellent choice. Each kibble of the IAMS Proactive Health is packed with the right levels of nutrients needed by senior dogs to maintain health and optimum functioning regardless of their age. Each kibble is packed with real chicken for protein while the addition of beet pulp facilitates healthier digestion among elderly canines. It doesn’t contain wheat and other allergenic grains, but it does come with healthier versions. The Proactive Health is one of the best dog food for senior dogs primarily for its right blend of proteins, carbs, and fats to help support the graceful aging requirements of canines. It has ingredients that support healthier joints, too. Clearly one of the best dog food for older dogs is the Hill’s Science Diet Age Defying Formulation designed specifically for elderly canines that are at least 11 years old. The Age Defying is formulated with amino acids essential for maintaining the optimal functioning of aging organs while the additional minerals and vitamins help support physiologic processes. It also contains powerful antioxidants like ascorbic acid and Vitamin E to help minimize the effects of aging on the mutt’s body and system while also boosting your canine’s immune system. Technically, when one talks about Hill’s Science, one can always depend on its quality formulation and the Age Defying is no different. It may be pricier though. However, with a brand name you can trust and a product that lives up to its reputation, then this rightfully belongs as one of the best dog food of adult dogs. The Wellness senior dog food is one of the best-selling senior dog food brands that you can expect to deliver high quality kibbles for your aging mutt. Each kibble is especially formulated using only the highest possible quality chicken for optimum protein and fatty acid. Augmenting the nutritional benefits of premium chicken are antioxidant rich blueberries and spinach and the omega-3 fatty acid rich flaxseed. It also has sufficiently higher proportion of protein in each kibble, accounting for not less than 22% while its fat is at 10% minimum. The Wellness Complete Health Natural dog food for older dogs also comes fortified with taurine which is essential for optimum cognitive functioning. This can be handy among senior pooches that may already be showing signs of cognitive decline. If not the addition of essential fatty acids as well as vitamins and minerals should help promote healthier cognitive function. It contains no artificial, harmful, or allergenic grains and other substances. If you believe in what people are saying about the Wellness Complete Health, you’d definitely want it for your senior mutt, too. Containing a blend of chicken, salmon, and turkey, the Nature’s Variety Instinct Raw Boost Grain Free Recipe stakes its claim as one of the best adult dog food for having one of the highest concentrations of protein packed in every kibble. Coming in at a minimum 33.5%, its protein content is one of the highest, owing to a reduction in its moisture content rated only at a maximum of 8%. The Instinct Raw Boost also contains DHA for eye and brain health, thanks to the inclusion of salmon oil. The chicken and turkey meal blended into the formulation provides chondroitin and glucosamine which are necessary for improved mobility. The Instinct Raw also includes probiotics which can greatly aid in the proper digestion of your pet’s food. These Nature’s Variety senior dog foods is actually a combination of grain-free nutrient-dense and high protein kibble and gut-friendly freeze-dried raw dog food. It’s no wonder then that it is priced exceptionally high. If you’re a fan of avocados, you’d definitely want the AvoDerm Senior Health+ for your pet, too. Considered as one of the world’s super foods because of its nutrient-dense characteristics, the inclusion of avocado alongside alfalfa meal, peas, and dried tomato pomace to beef up the rich nutrient profile of lamb, chicken, and salmon is definitely a good way to ensure optimum nutrition for aging pets. And since it is grain-free, you won’t have to worry about grain-associated allergies. If any, the inclusion of lamb and salmon into the blend should help minimize any potential allergies to chicken. The AvoDerm provides exceptional essential fatty acids for a variety of anti-inflammatory effects while also promoting skin and coat health. It doesn’t have protein content that’s as high as Nature’s Variety Instinct Raw Boost, but it sure is sufficient at 28 percent. Additionally, since salmon oil is included, one can always feel relieved to know that the Avoderm Senior Health+ already includes both EPA and DHA in its formulation. And it has a friendlier price tag, too. One of the most striking features of the CANIDAE Life Stages Formulas is that it has a complete line of products for all canine life stages. Its Less Active Formula is especially designed for elderly canines integrating 4 different sources of protein including chicken, lamb, turkey, and fish. The addition of turkey and lamb should help minimize the allergenic potential of chicken while its fish content supplies elderly canids with essential fatty acids for improved brain and eye health. The Less Active formulation contains less protein and fat content to account for the diminished need for such nutrients by senior pooches. Nevertheless, CANIDAE uses only premium natural ingredients without allergenic grains. It also includes gut-friendly probiotics making it a lot easier for older dogs to absorb the nutrients in their kibbles. The Less Active formulation is also enriched with antioxidants to help minimize the effects of age-related oxidative stress on pets. Do Older Dogs Need Special Diets? One of the most important physiologic changes that occur with aging is the slow decline of the dog’s energy levels. It is not really because they have grown lazy but rather because of the reduction in the function of organs that are associated with mobility. They may already have arthritis or other joint problems that can significantly impact their mobility. The pain and discomfort associated with these conditions can make moving quite frustrating. As a result, senior dogs may prefer to simply lie down all day long. When this occurs, they no longer require too much energy coming from carbohydrates. As such, one of the essential dietary changes that elderly mutts will undergo is a reduction in their carbohydrate and fat intake since carbs are the primary source of calories for energy and fats providing highly concentrated forms of energy. However, while older mutts will benefit from reduced caloric intake, they will need more fiber in their diets as these can help facilitate normal digestion and the more efficient movement of bowels. Immobility has a negative effect on gut peristalsis so introducing fiber into their diet will help facilitate the removal of these wastes in the gut. Another reason why their diets need to be lower in calories is that their metabolic rates are significantly reduced. Coupled with inactivity, they are now more prone to the development of obesity and its associated metabolic problems. Older pooches will also require more water as the inherent ability of their body to balance water decreases with age. The risk for dehydration and fluid and electrolyte imbalance are amplified with reduced water intake. That is why it is crucial to offer older dogs clean and fresh drinking water. However, if mobility is a problem or if the mutt doesn’t want to drink, then giving it a moisture-rich dog food should suffice. Older mutts also require low-sodium and low-fat diets as the risk for metabolic problems is increased exponentially if they are fed too much of these nutrients. Since mobility is a major issue among older canids, you can provide them with supplements that contain glucosamine and chondroitin, although there are many dog food formulations that already contain these two substances. These molecules can help relieve the symptoms of arthritis and other conditions of the articular surfaces by improving the production of synovial fluid and by increasing the flexibility of the joint capsule. Overall, these lead to improvement in their mobility, although experts recommend weight management can also provide the same benefits. Older pooches also benefit from higher-quality proteins. It should be noted that proteins help in the maintenance of a healthy body weight while also keeping muscle mass. High protein intake also relieves pressure on the kidneys, further minimizing the risk of developing kidney-related canine diseases. In a gist, senior canines require high protein, high fiber, low fat, and low carbohydrate diets. They will also benefit from micronutrient-rich canine chow. Are there Health Problems that Can Affect the Diet of an Elderly Dog? The elderly diet we described above is specifically for normal, healthy senior dogs. Unfortunately, if they have existing health problems, their diets may have to be specialized to account for the nutrient requirements of these health problems. Almost all aging dogs present with arthritis which is characterized by inflammation and immobility of the affected joints. It is almost similar to the arthritis experienced by humans. Inflamed and painful joints will limit mobility that you don’t want to move at all. Elderly dogs with arthritis can benefit from supplementation with chondroitin and glucosamine. If these substances are already present in your pooch’s diet, then there clearly is no need for supplementation. Additionally, one can include alfalfa, ginger, papaya, and celery in their canine food as these natural ingredients have been shown to reduce some of the symptoms of articular conditions. While giving dry kibbles can help prevent, or at least minimize, the development of periodontal diseases, advancing age is always characterized by the deterioration of the integrity of tissues, bones and teeth included. Because of the continuing degradation of tooth integrity, it becomes more susceptible to the development of tartar and plaques which can introduce bacteria and other harmful microorganisms into the deeper structures of the teeth until such time that these germs reach the gum tissue. Although there are no diets that can help treat gum disease in dogs, there are those that can help retard the deterioration of the teeth’s structure. Calcium-rich foods as well as foods that are low in starchy carbohydrates can help. Calcium can strengthen the integrity of the teeth while reducing the intake of carbohydrates can deprive germs of energy to grow. If you think diabetes is inherently a disease among humans, you’re wrong. And while canids cannot be given insulin or even oral hypoglycemic agents, their diets can play a role in the development of diabetes. Since the major culprit in diabetes is the abnormal accumulation of glucose in the blood, a canine diabetic diet is centered on reducing the carbohydrate content of food. This means that fewer carbohydrates will be converted into glucose. Additionally, increasing the fiber in their diets can also aid in the management of diabetes. Fiber gives bulk to the food and most of this is actually eliminated and never absorbed. As such, they don’t get converted into glucose. Moreover, providing food that is slowly absorbed can help prevent the abrupt increase or sudden spike in blood sugar levels. For diabetic senior canids, this might be tricky as they may have other problems that can compound their diabetes. Visual changes are expected as one ages. And this is true even for pet canids. The important thing to remember is that, if your older pet already has problems in its vision, a trip to your veterinarian will be necessary. More often than not your mutt will be given a diet that is rich in docosahexaenoic acid and beta-carotene. DHA is well-regarded in improving the nerve impulses transmitted across the eye structure while beta carotene can help enhance the function of photoreceptors inside the eye. Unfortunately, there are no diets that can really cure complete blindness. Senior pooches that have kidney problems can benefit a lot from a well-designed renal diet that consists of low higher-quality proteins, low in phosphorus, and high in moisture. Maybe you lost us in the “low higher quality proteins”. What we meant is that your pooch requires higher quality proteins but in lower amounts. Because the kidneys are already dysfunctional, providing too many byproducts of protein metabolism can put additional strain on the kidneys. Too much phosphorus can also put added stress on the kidneys. Giving your pet pooch wet or canned dog food is ideal as the increased moisture content can help the kidney in its function; after all, the kidney relies on water to be efficient. Elderly canines with cancer often have their immune systems substantially affected. If they are undergoing cancer therapy, most of their tissues are also damaged and these will need to be replaced. The diet of a dog with cancer should thus, include high protein, high fat, and grain-free. The reason is quite simple. Protein is needed to support tissue building processes while fats are required to ensure the integrity of these newly-built tissues. Going for grain-free and non-allergenic foodstuffs can help prevent putting strain on the already-compromised immune system. Forgetfulness. That’s what dementia is to most people. Elderly pooches have it, too. Good thing dog chow formulations that are rich in Vitamins C and E, beta carotene, carotenoids, flavonoids, selenium, DHA, and EPA have been shown to be especially helpful in improving canine memory and cognitive functioning. Choosing the best chow for your aging pooch is not really easy as these types of pets often have underlying medical problems that can compound their ability to process food. In most cases, they will also require specialty diets based on their existing health condition. So how do you choose the right food for your senior dog? Start with a comprehensive assessment by your vet. Your veterinarian can provide you with exceptional advice on what to feed your aging mutt depending on its health profile. If it has any of the common diseases that affect senior dogs as we have presented in the preceding discussion, then you must be made fully aware of specific diets. Unfortunately, if there are coexisting diseases that require conflicting dietary requirements, your vet can show you the best way to address such issues. Always choose higher quality protein sources. Protein is perhaps the most important macronutrient in aging canines. This is needed to support the ongoing tissue-building processes that aim to replace age-damaged tissues. Without protein, you will only be hastening the deterioration of your pet pooch. Even pooches with kidney problems can benefit from high quality proteins, albeit at much lower quantities. Make sure to include wholesome grains. A lot of folks are wary about the word ‘grain’. While grain free diets can be beneficial to pooches with immune system problems, wholesome grains like oatmeal, brown rice, and quinoa are exceptional sources of amino acids. These are proteins that no longer need to be broken down as they are already in their simplest forms. This means they are readily used by the body to build tissues. No matter how well their marketing efforts go, don’t pick a product that comes with anything but natural ingredients. Everyone is already aware that anything artificially synthesized is not really good for you and for your pets. From preservatives to coloring to flavorings, as long as it is not natural, stay away from it. Elderly dogs require the rights amounts of the right nutrients that are appropriate for their overall health. Unfortunately, it is also not uncommon that dogs can lose their appetite sometimes. This can have more profound effects on older canines. So what should you do then if your old pooch simply refuses to eat? It is important to check with your veterinarian why your pooch is not eating. Any disease or illness must be ruled out first before you can start enticing your pooch to eat. For example, if they have stomach upset, they will typically be nauseous, causing them to not eat. Also, if they have cancer, they will generally lose their appetite. Now is the time to cook some well-deserved treat for your pets. Just remember not to put any ingredient that is considered hazardous or toxic to pets such as garlic, onions, and many more. Cooked chicken with brown rice or even lamb with rice should help them get interested in eating again. This should only be done if your home-cooked meals don’t work. Sadly, many of these come with artificial ingredients so you have to look for those with natural flavor enhancers. Elderly canines need special diets because of the changes in their body that are brought about by the aging process. Generally, they will require more higher-quality proteins, fiber, and water and less of fats and carbohydrates, especially the starchy ones. Older mutts also require specialized diets if they happen to have medical conditions such as diabetes, kidney problems, arthritis, cancer, dementia, and others. Choosing the right food for them is thus, crucial. To do this, you need to check with your vet the specific type of diet that your mutt needs, especially if it has a health problem. With the 10 best senior dog foods you can narrow your search for the most appropriate chow for your elderly mutt.